The Le Sigh: Premiere: Allison's Gate - "Street V"
Premiere: Allison's Gate - "Street V"
Watch a mesmerizing video from Allison's Gate. Back in February, we sung our praises for experimental artist Allison's Gate's latest album, Sink or Swim. Musician Carolina McPhail spent five years plastering together sounds for what ultimately turned out to be an aural scrapbook unlike anything else. The songs are more improvisational than structured, distilling down a moment in time that could never be repeated. McPhail originally is from the Channel Islands, and the isolated nature of her home is the undercurrent of her music. You can feel her songs, largely delicate and ambient but rarely consistent, floating in from a place where the ocean and sky infinitely blur together. To accompany the penultimate track on the album, titled "Street V," McPhail pieced together a video that's as mesmerizing as her music. 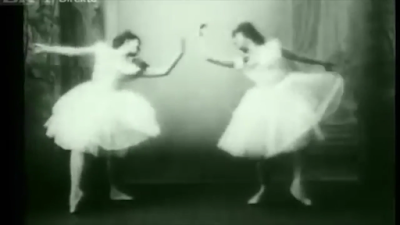 The clips rotate between shots of blinds blowing in the wind, old footage of dancers spinning on loop, and a spider climbing its web, never reaching a destination. It exists somewhere between soothing and unsettling, matching the mood of the song which ebbs like a continuous wave but is peppered by jarring crackles. The scenes that make up the video might seem like they have little in common, but they all project an idea of endlessness when collaged together - much like Sink or Swim itself. Watch the video below and be sure to lose yourself in Allison's Gate's beautiful soundscapes.